Travel to a world of excitement! 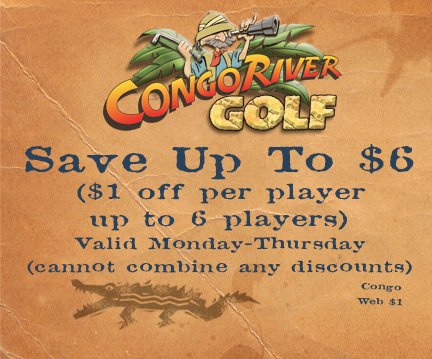 With 18 holes of award-winning miniature golf, an African exploration featuring the signature zebra-striped plane, gemstone mining, arcade room fun, opportunities to feed live gators and more, you can see why Congo River Golf is #1 in Florida. The Orlando I-Drive location is conveniently located on International Drive just West of Kirkman Road. Your Safari Guide has the perfect adventure waiting for you. Ages 10+ . . . . . . . . . . . . . . . . .
Ages 9 & under . . . . . . . . . . . . . . . . .
One child 4 & under . . . . . . . . . . . . . . . . .
Sunday - Thursday . . . . . . . . . . . . . . . . .
Friday & Saturday . . . . . . . . . . . . . . . . .